Monday, 25th August: The weather has been pleasant as there were a few showers in the beginning of the week. Light, cool breeze kept the day heat at a low. Cloud cover continued till Saturday, with rains in the adjoining area of Bali. Evenings were interspersed with thunderstorms but Bali was deprived of any rains. Lowest temperature recorded at 23°C and highest at 34°C. Humidity has taken a dip from 85% to 45% at present. Tuesday, 26th August: Two guests Mr. Niraj Sharma (Ex Physics Teacher Maheshwari School) and Ms. Veenu Paliwal, visited the school. Veenu Paliwal, a post graduate in Economics and Management from Manchester University, U.K. is the Managing Director of concept Education. Her forte is psychometric analysis and career workshops. She took her training in psychometrics under Dr. Achal Bhagat from the Sarthak Institute, Delhi. Escorted by Mr. Byju Joseph they both went around the campus then Ms. Veenu Paliwal met the students of Class XII, XI and X in two batches in the A.V. Room. She counseled students and asked them whether they had opted the streams according to their parent’s choice or their own choice. She’ll visit our school next month and will take an aptitude test which will help us to know what is good for us and what subjects we should take up. We are thankful to Mr. Neeraj Sharma and Ms. Veenu Paliwal as they both have volunteered to work for the school. Mr. Neeraj will return in November or December to take crash course classes in Physics for Class XI & XII, while Ms. Paliwal will be our career counselor. After taking Aptitude Tests with our students she will not only be conducting counseling sessions with students but parents too. 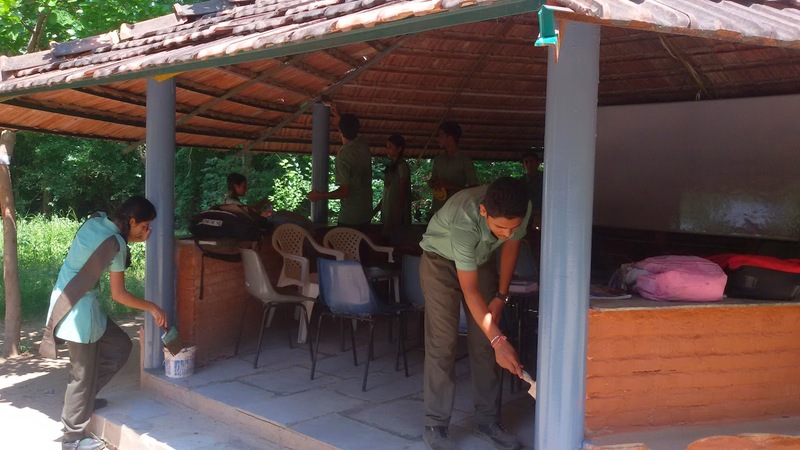 Thursday, 28th August: Class XI (Commerce batch) excitedly painted and decorated their class in the hut next to Block I. The students enjoyed their work thoroughly. Mr. Surendra Singh their class teacher also helped them and gave them instructions. Thursday, 28th August: Since, Friday, 29th August was declared a holiday for Ganesh Chaturthi, hence on Thursday Class VI B conducted a Special Assembly. They celebrated the National Sports Day in honour of the Legend Major Dhyan Chand’s 109th birth anniversary. Khushal Singh and Kareena Rao spoke about Dyan Chand the famous hockey player, who was renamed ‘Chand’ from ‘Singh’ because he used to practice in moonlight. Anumesh Rao sang the Bharat scouts song Daya kar daan bhakti ka hamein parmatama dena. Pushpendra Singh and Pankaj Suthar talked about Bharat Scouts and showed its symbol on a poster. Saturday, 30th August: Class II put up a sports fashion parade to uphold integrity for sports in honour of Major Dhyan Chand. Kush Sutharand Prateek Choudhary represented Dhyan Chand; Chitrangana Bharti represented Sania Mirza; Dushyant Singh represented Baichund Bhtutia; Ankush Sirvi represented Abhinav Bindre; Aditya Raj Singh represented Sachin Tendulkar while Jinal Sirvi walked as Saina Nehwal. She is the one who helps to make my project file. As she cares for me a lot! And gives me medicine when I’m ill.
She is everywhere where I go. She is a bow and I an arrow. Earth is nothing without Sun. So am I without her. Monday, 25th August: For five days FA II were conducted for Classes VI to X in all subjects. Students have seriously got down to studies for SA I that will take place in the third week of September. Teachers too have got busy in finishing syllabus of their respective subjects. In order to recognise new teaching ideas and practices, the school has begun to recognise its teachers through "Teacher of the Month". The Staff meets at the end of the month and shares any new methodology in class teaching that they tried during the month and how it worked for them. Once all have shared, in a very democratic way they decide which teacher's work deserves to be appreciated and unanimously select the "Teacher of the Month". 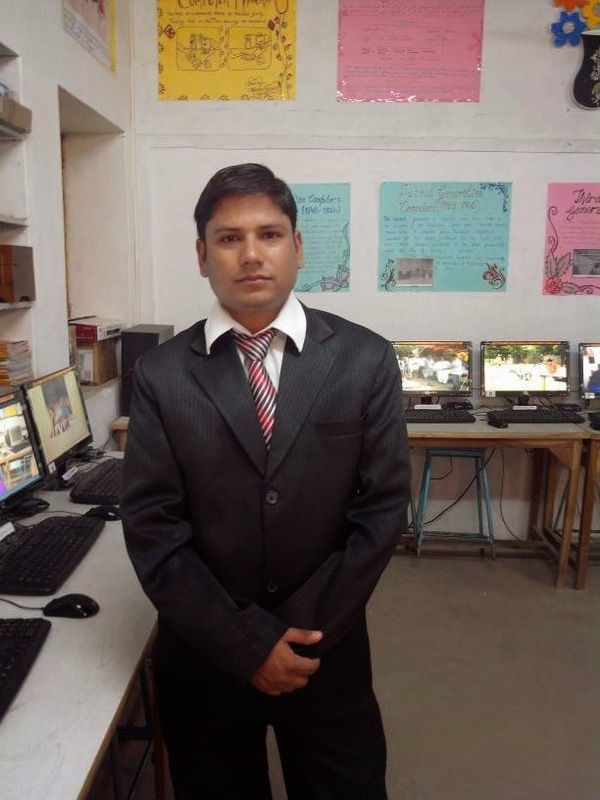 Our congratulations to Mr. Suresh Negi for being our first Teacher of the Month (August) for 2014-15! The School Weekly is compiled by Bharti Rao for The Fabindia School. The School Weekly drives away the so called Monday blues! Thank you for wishes us a bright week and sharing the joy as well as the spirit of the most wonderful children in Bali. FA means Formative Assessment. It is a new way to assess the students under CCE (Continuous Comprehensive Evaluation). This assessment contains 40% of weightage and is conducted twice each term.In this assessment various types of activities are carried out to assess the students in various skills and fields.